Cockburn’s recording career has spanned more than 40 years after releasing his self-titled debut album in 1970. His early work attested to his strong Christian beliefs, with lyrics like “Christ is born for you and me” in the song A Life Story. Later in his career, Cockburn began devoting his music to more progressive and political issues, evidenced by the song If I Had A Rocket Launcher on the 1984 album Stealing Fire. He wrote the song after witnessing Guatemalan helicopter attacks on refugee camps in Mexico. Cockburn has also taken up the crusade against U.S. President George W. Bush and the war in Iraq on his latest disc, Life Short Call Now, with songs entitled This is Baghdad and Tell the Universe. He has also worked with Friends of The Earth, the David Suzuki Foundation, War Child Canada and Mines Action of Canada. 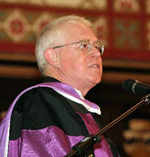 Cockburn was given the doctorate in recognition of his artistic, humanitarian and theological contributions to society, principal Jean Stairs said. Queen’s vice-principal Patrick Deane attended the ceremony on behalf of the university. He said the world is a better place because of Cockburn’s music. “Your music has provided the soundtrack for the last several decades for many of us,” he said. The Queen’s doctorate is the fourth such honour for Cockburn. He has also received doctorates from York University in Toronto, Berklee College of Music, and St. Thomas University in New Brunswick. Later this month, he will receive his fifth, a doctorate of letters from Memorial University in Newfoundland. Isn’t ceremony a wonderful thing! It’s a great, and I have to say, unexpected honour to be here today to receive this degree. Unexpected because in all the thinking I’ve done about God, I never imagined any sort of public acknowledgement of it. Nor did I feel particularly qualified to carry the title, but that’s Grace, isn’t it? Comes at you out of nowhere and spins your life in new ways! Grace: A couple of months ago I was doing a phone interview with a guy at a radio station in Madison, Wisconsin, and he asked me about a particular song on my most recent CD. The song is called Mystery. He quoted these lines: “Infinity always gives me vertigo, and fills me up with Grace.” Then he asked me “How can you have vertigo and grace at the same time? Isn’t that a contradiction?” It took me a minute to realize that, for him, grace was about being a good dancer, or being able to do tricks on the balance beam. Never having been good at any of that sort of stuff, I have not had to be confused about what Grace means. I’m alive because of it. I’ve made a lot of music and had some great adventures because of it. Grace is what we all need, whether we know it or not. We can, by virtue of great effort, expand our understanding of things, sometimes even expand our ability to do good in the world – but it doesn’t take much looking around to see the limits of even the best-intentioned human behaviour. Without that element of alignment with the flow of creation, the New Jerusalem remains out of reach. I mean, the people who founded Montreal believed they were building the New Jerusalem! Some years ago I spent 5 weeks in Nepal, mostly visiting development projects supported by the Unitarian Service Committee of Canada. At the end of the trip we traveled to the region of Mt. Everest and spent days walking the steep trails through a magical landscape of flowering rhododendron trees, rivers rushing down deep canyons, frightening heights and beautiful sights. At every crossroads was a stone cairn built by pilgrims over centuries, each rock carved with prayers and carried to the spot from wherever they came from. By every building colourful prayer flags fluttered, the passing wind carrying their message to the ends of the earth. A landscape of devotion – charged with the energy of the Spirit. As we ascended the path one morning, we met a small party of travelers coming down. An elderly couple who turned out to be American and some Sherpas. We stopped to chat. The old man told me he had left his teaching job at a seminary in the Midwest to come to Nepal 25 years earlier to bring the Gospel to its people. He was about to leave to return to the U.S. and was taking one last opportunity to appreciate the spectacular surroundings. I felt terrible for him, as he appeared so oblivious to the spiritual surroundings. He’d spent ¼ of a century not learning what he might have about God! Because we are who and what we are, it’s almost impossible for us not to think tribally, to be judgmental of our neighbours, to feel that our approach to the things that matter, because it suits us, must also be appropriate for those around us. I don’t think God is about that. It it’s true that love is the attribute of God that is supposed to have the greatest affect on us, how can it flower in a soil of divisiveness, false pride…fear of the other? We all have our strengths and weaknesses. I can play guitar better than some people. Somebody else can run circles around me when it comes to math. Someone over there can wrestle, or grasp the patterns in the movement of subatomic particles. Some of us “get” our bodies really well. Others are more open to the Spirit. We all have our insights, and together we add up to a healthy organism. That is, if we only look at the good things. We still carry the seeds of our destruction. In fact, it seems to me that this internal contradiction is also evident in the way we interface with the world. We, as a species, are in a race between our collective urge to self-destruct and our longing to feel that alignment with the cosmic flow I mentioned a minute ago. If we make life choices based on fear, or greed, or extreme self-interest, we are on the side of chaos and death. If we can grasp how inter-connected with each other and the rest of creation we are (and I’m not only thinking of the physical systems that give us life, but the spiritual spaces in and around us too) and make our choices based on that understanding, which I think we can call Love, then we serve the greater good without resorting to badges, and team uniforms, and hopefully, weapons. We are heading into a time of tribulation. I’m not saying it’s the Tribulation, as some of our fundamentalist friends think. It’s not our job to second guess God. But tribulation none the less. Massive change is upon the world. Massive and rapid. In your lifetime you’ll experience the price of the industrial revolution. Changing climate, global epidemics, economies shattered by planetary warming and wars and pollution. A lot of people will be on the move in coming years, even more than at present. Those who are lucky enough to be able to stay where they are will feel the movement in the form of pressure on all systems, surrounded by the pain of other people’s upheaval. You, who care enough about our relationship to the Divine to have committed to spending years studying it, will be given a special burden to bear. That relationship, at least the traditional concept of it, doesn’t have much currency in the Western world, the popularity of Evangelical churches not withstanding. Between the dogmatism of fear-based fundamentalism and the Battlestar Galactica New-Aginess of Hollywood, down there in the cracks, there is room for the sharing of real understanding – of personal, experiential knowledge of God – of LOVE. And that’s your mission, should you choose to accept it – to get that experience – to be fueled by that love, and to go forth and share the insights and the inspiration you have gained therefrom. Don’t worry about making converts. If you go out there shining with the light of God and brimming with love it will be noticed. A door will be opened for the Spirit to walk through. Whether that Spirit gets discussed in Christian terms or not is not really material. It’s being awake to its presence that counts. That is the beginning of a remedy for the pain of being alive in dark times, just as it’s the beginning of the healing of our not-so-well-carried-out stewardship of our Earth. And look – we’re back to talking about Grace! At the risk of taking too long here, I’d like to leave you with the lyrics of a song I wrote awhile back. It’s called The Light Goes On Forever [disc #7]. looking for clues about what is to be. Chants and trances give his spirit wings for flight. let me rest in the place of light. sends out ripples in the gathering night. The deepest darkness breeds the brightest light. let me rest in the place light! Gypsy searches through the cards for truth. Alchemist searches for eternal youth. and so strikes out at what the wind blows by. let me rest in the place of light! the light goes on forever. infinity stoops to touch the human mind. Let me rest, in the place of light. That’s it. Go with God.